Learning the various forms of figurative language is prevalent in the 4th grade Language Arts curriculum of my district. We focused our Reading lesson on similes on day. I read the students Owl Moon by Jane Yolen and the students were asked to look for similes. Then I researched on the internet various similes. The students then selected a simile to describe themselves. I typed them up and posted them outside our classroom. It has become a learning board to the classes that pass our room each day as they pause to read and learn about similes. 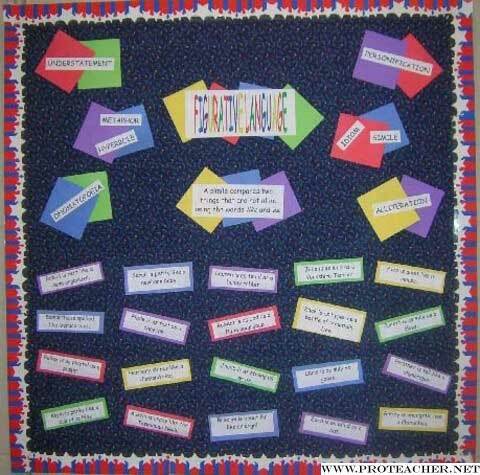 Above the similes, I have posted the other forms of figurative language that we are learning in preparation for our district benchmark tests and standardized testing. We as teachers know that just having the words posted for long periods of time has been proven as beneficial to our students by storing the words and what they mean in long term memory.